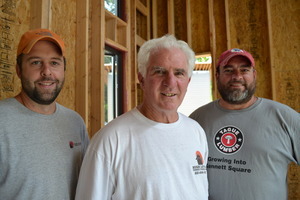 Hugh Lofting (center), along with project manager Jeff Shaw (left) and Steve Siever, assistant project manager. 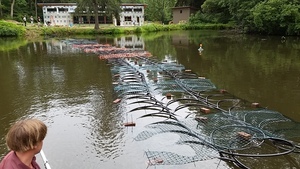 Thermal coils used to provide heating and cooling for the home were recently installed in a two-acre pond near the home. An energy-efficient porch overlooks a two-acre pond, and beyong, several acres of woodland. The Camp, so named by its new owners, is in the middle of a seven-acre patchwork of woods, streams, fields and a two-acre pond in Landenberg, and if a visitor did not know any better, he or she would feel removed from any notion of neighbors or outside interference. It is a Private Idaho of peace and serenity, where a bald eagle or osprey may do a flyover at any minute, and where the setting sun over the pond turns the sky into a pale gold. Through the end of November, The Camp is also serving as the working canvas for builder Hugh Lofting of Hugh J. Lofting Construction Management Services. If it isn't already the perfect marriage of design, creativity and efficiency, it sure will be when it's completed. For the last 30 years, Hugh Lofting Timber Framing, Inc., headquartered in West Grove, has been one of the nation's leaders in the design and construction of timber frame homes. Using hand-carved timber, the Lofting group has made its reputation by combining old world craftsmanship with new world technology – not only in residential building, but in the design and construction of public buildings. Open the door to any of the company's projects and you will also find a commitment to energy-efficient, environmentally aware design and building – from reclaimed timbers to passive solar design to low-impact “green” materials, Hugh Lofting is committed to passive house and LEED construction as a way of the future. At the end of last year, when the owners approached Lofting and his colleagues with the idea of constructing an extremely energy efficient home at their Camp site, they were quickly on board. As a result, the 2,700-square-foot, single-floor home, scheduled to be completed by Thanksgiving, is being built with special attention to heating and cooling demands and costs. When Steve Hessler, designer with Hugh Lofting Timber Framing, Inc., first looked at the original designs for the home that were created by architect Townsend “Townie” Moore, he was hooked. “Townie created the vision of the owners, and as we do with architects, we moved it from development and concept into construction,” Hessler said. “Along the way, we helped the owners visualize the exterior and then worked with them to create a design for the home's interior. In 2007, a client asked Lofting to build a LEED-certified house, but he'd been doing sustainable construction since he began the company in 1974. Lofting and his crew are not the only ones at work on the construction of The Camp. Electronic Home Solutions in Hockessin is installing a home automation system that will allow the owners to control lighting, heating and cooling and a media center through a smartphone or tablet application – eliminating the need for multiple on-off switches and remotes. In addition, the owners have requested that Electronic Home Solutions have the proper wiring infrastructure in place for when they need to have access to healthcare professionals or caregivers. Lofting said that he sees houses like the one at The Camp becoming a template for how home construction will be done in the future. 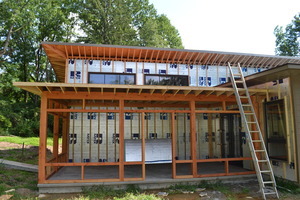 To learn more, visit www.hughloftingtimberframe.com or www.hjlcms.com.